Hero Arts | 2016 Summer Catalog Preview – Color Layering. Giveaway! Hello friends! Its that time of the year again, time to hide our credit cards and close the tabs in our browser and not look at new fantabulous (yes, I just made that word up) products from Hero Arts. 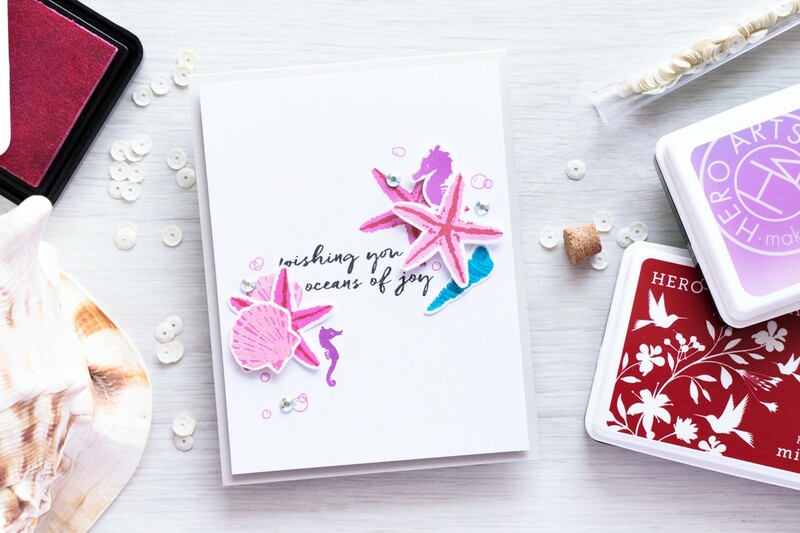 This week Hero Arts is sharing a few peeks into their new Summer 2016 Catalog (to be released on April 18th) and I am excited to share several cards of mine designed specifically for the catalog. 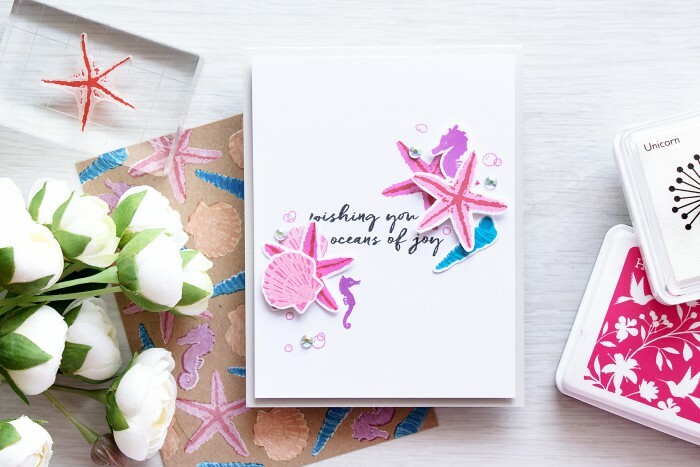 We are starting with Color Layering (using several layers of one image and stamping it in several color of ink to make it appear dimensional and more interesting) and what could be better than sea horses, shells and the ocean? 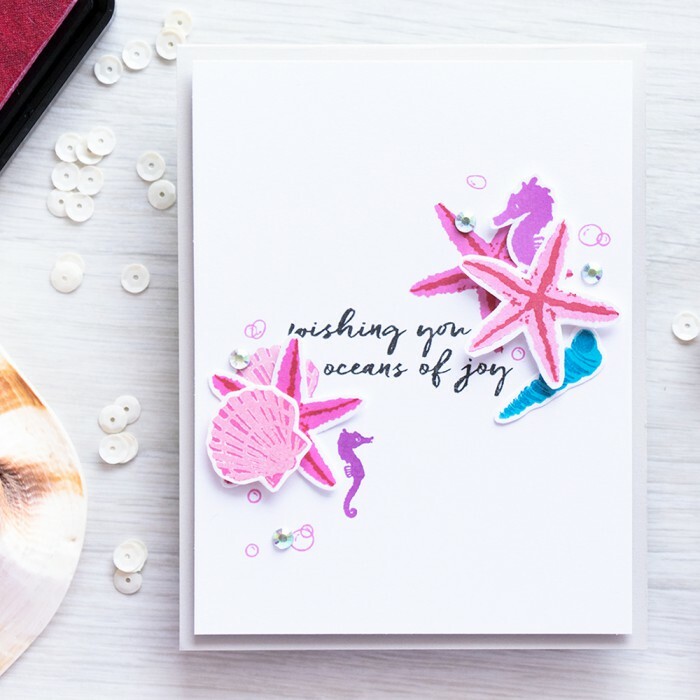 Wishing You Oceans of Joy – I think this is such a fun and unique sentiment! 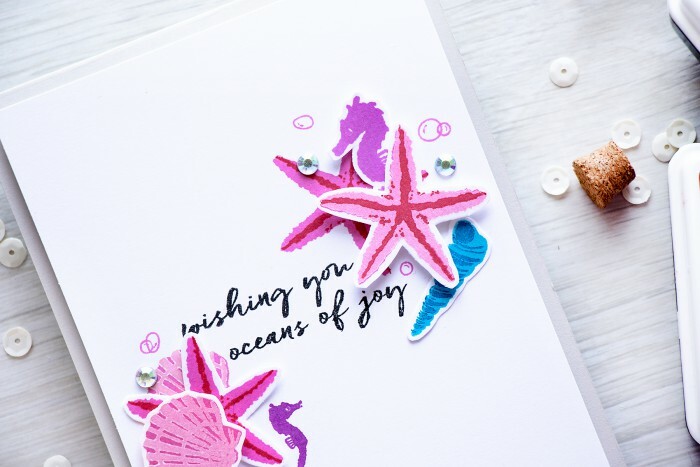 The images I have here were stamped in several colors of ink; I used Ultra Pink and Royal Red for the darker star fish, Ultra Pink and Unicorn White for the shells and lighter star fish, Ombre Light Purple to Grape Juice for the sea horse and Summer Sky and Deep Ocean for the long shell. I also added a few gems from the CH235 Diamond Gems pack and foam mounted my white panel onto a light grey card base. Stay tuned for more previews on Hero Arts Blog, I’ll be sharing 2 more projects later this week. Comment below and visit other Creative Team Memebers Blogs and comment and Hero Arts will randomly select one winner from all of the comments to receive a $25 shopping spree in the Hero Arts store! Please comment by Sunday, April 17 at 11:59pm PST, and Hero Arts will announce the winner the following week. After visiting each blog head back to Hero Arts and let them know – which new Color Layering set is your favorite? Your color layering card is so clean, sweet and simple! I love it! This is by far my favorite set! I love this card. So classy, simple, and beautiful. This set gives me life!!!! Love the details on these stamps. Awesome card! Yana, your card is so pretty, loving the colours you’ve used here. Yana! You Always Amaze Me with Every single Card You Create! I Adore This Card so Much. Both cards are beautiful! I like how bright the first colors stay when you add the Unicorn White ink on top! Great card, thanks for shaing! Love this, such great design! Love the sentiment on this card. Also a fan of the color layering. Wow!!! Stunning card!! Love the layout!! Love this card! The colors and design are fab. Liked the beach scene. The palm tree is really cute. What a beautiful card! Love the color layering! Yana, I have been following you for quite a while, but don’t have opportunity to comment as often as I want to. Everything you create receives plenty of gazing and admiring; oohing and ahhing (I’m sure if you tilt your head towards Canada, you’ll hear me!). Your videos, your projects, your cards: you are a gifted, creative designer and we’re so fortunate you share your talents with us so generously. This card: stunning. You create magic! Visiting your site always lifts my spirits. Always! Beautiful card love the colorful layers. So pretty. Gotta love ice cream and the endless creative possibilities of color layering. Just lovely! I love the color layering with the stamps. My favorite! 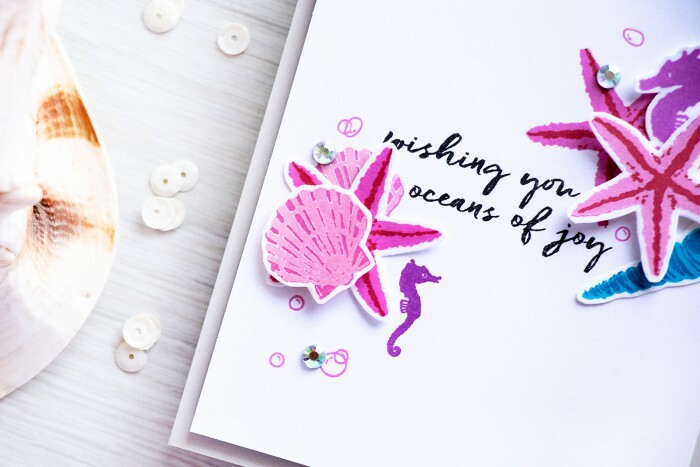 I love the way you layered your seashells and the colors you chose for this lovely card! What a sweet sentiment! And I love the pretty colors you chose for this card.